Bachas Beach on Santa Cruz Island is the first stop on many cruise itineraries, and a perfect place to introduce you to the Galapagos Islands. 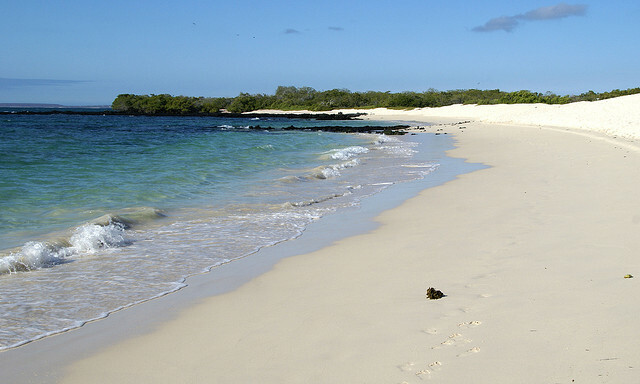 Here, from a beautiful white sand beach, you will be exposed to part of the rich human history of the Islands, both land and marine iguanas, nesting Galapagos green sea turtles, endemic flora, Sally Lightfoot Crabs, flamingos and pelagic birds, all to be topped off with a swim in the Pacific Ocean, replete with gorgeous vistas and the Galapagos blue sky. Heaven! So, let’s begin our Bachas Beach journey. From your cruise ship, you will take a panga to a wet landing, meaning your feet dip into the Pacific Ocean for the first (but certainly not the last) time on your visit. You arrive on a pristine white sand beach and feel the warmth of the sand and sun. The walk here is not strenuous, but an opportunity to let the surroundings pull you in, to relax, to feel the uniqueness of the world around you and to put yourself in the moment - a place you will want to be throughout your Galapagos visit.